A delightful, fun mix of Irish drinking songs with a special touch for the cat lover. Back in high school, I was huge fan of Weird Al. It was a natural progression because my dad was a fan of his comedic predecessors. When I grew up, he sang lots of comedic songs. He'd parody songs and write songs on the fly while playing his banjo. So it was natural for me to hear Weird Al's parodies and become a huge fan. I bought Weird Al's albums and listened over and over again. But I had one small problem. Not all the songs were parodies. And those that were I wasn't entirely sure what the original songs were because I lost the cassette jackets or the jackets were incomplete. So in my senior year of high school, I made my own compilation tape featuring the Weird Al song, followed by the original version. It was neat to hear the differences. It was this desire to hear the original that inspired me to record a new CD: Irish Drinking Songs: The Cat Lover's Companion CD. This album features all of the original songs found on my Irish Drinking Songs for Cat Lovers CD. You can hear how a song evolved from a fun Irish song into a purrfectly fun song about the cats we love. While the production isn't nearly fancy as on Irish Drinking Songs for Cat Lovers, it still has all the energy and fun that you enjoy from that CD. All the music comes from my producer Ari Koinuma and Marc Gunn. Gunn’s activities are not restricted to musical performance alone. He is the brains behind an online resource called the Celtic MP3s Music Magazine. The weekly publication reviews Celtic music of all varieties from Irish traditional music to Celtic rock. Two free, full-length MP3s are offered for download every week on the site. Additionally, Gunn publishes The Bards Crier's Music Marketing and Promotion Tips Ezine, a newsletter that teaches musicians about marketing and promotion, and handles webmaster duties for a variety of sites including the Austin Celtic Association. All that hard work and effort has hardly gone unnoticed. Fans have downloaded more than five million MP3s from him; over one million of those were for the hugely popular “Tolkien (The Hobbit and Lord of the Rings).” The Brobdingnagian Bards were voted “Best Renaissance Men” in the Austin Chronicle’s 2003 Best of Austin poll. In March of 2005, The Bards collected an Austin Music Award for the Bards as Best Novelty Band, the first time any Celtic band has won. Gunn’s solo CD Soul of a Harper won the Best Cover Art category that year. In a town famous for almost every musical genre except Celtic music, Marc Gunn has raised the bar and held it high. Using the musical past and a vivid imagination bolstered with ambition and drive, he blazes trails from terra firma to cyberspace, encouraging others to follow. This is a fun CD, and if you are fortunate enough to be a part of some cat(s) life, the songs on this CD will really ring a bell with you. In short, my wife and I love the music and fun lyrics! Marc Gunn brings us a wonderful collection of Irish songs interspersed with a couple of meows that made me smile. I enjoy both his voice and his autoharp. I don't have a great familiarity with Celtic music so this was the perfect companion to the Irish Drinking Songs For Cat Lovers. My favorites are Finnegan's Wake, The Patriot Game, and Gypsy Rover. But all of them sound great. If you bought that CD get this one. You'll love it too. A great choice for new fans of Marc Gunn's work! It often takes me quite a while to warm up to a new album, but after only two days, this one has already taken over my ears; it has me tapping my toes and singing to myself even as I'm walking around my daily routine. I am especially fond of The Barnyards of Delgaty, a cheerful little romp of a song, and my favorite song on this album is Fiddler's Green, a more reflective ballad. I like how Ari's guitar provides a firm bass line as a foundation in those and several of the other songs; it's a welcome balancing addition to the predominantly high tones of the autoharp, and it gives an excellent foundation for Marc's powerful tenor. Marc is in particularly good voice on this album; several of the songs that are on other albums have a more mellow sound here, and while I enjoy the rough-and-ready cheer of the sound on albums like "Songs of Ireland," I also love it when Marc's voice is more mellow and reflective, which you get on most of the songs here. I do find myself wishing for Andrew's ability to create a relatively seamless blend of his voice with Marc's on several songs, which no doubt has its foundation in their long history of singing and practicing together, and I sometimes miss the bright, clear sound of the mandolin when Ari takes up a melody line on his guitar, but the new sound grows on me more every time I listen. That very sound makes this album a perfect choice for new fans of the Brobdingnagian Bards or of Marc's solo work, who will enjoy its cheerful, pleasant quality without missing Andrew's contribution as much as a long-time Nagian may. Marc Gunn performs Irish and Irish-influenced music both solely and as a member of the Brobdingnagian Bards. Not long ago, he had the wild idea to release a CD of Irish drinking songs for cats. It sounds crazy, but it really was a fun CD. Now, Marc has released a CD of Irish Drinking songs for humans, and this human absolutely loves it. Marc has a perfect voice for Irish music, and the perfect attitude. I especially love the humerous drinking songs, and Marc's enthusiasm and barely suppressed laughter give these old songs brand new life. When Marc sings "When Irish Eyes are Smiling," for instance, you don't get the sentimental twaddle this song sometimes becomes. You get smiling! Irish! eyes! "Wild Rover," which is my favorite Irish song anyway, really carries you back to a bygone pub in a bygone time and a romantic wild Irishman telling his tale. "Finnegan's Wake" has never been more fun. There's not a bad song or a bad performance in the bunch, although I will say that I have heard "Patriot's Game" enough on different CD's and did not really need another version. But then "Lord of the Dance," makes up for that, although for the real definitive version of that song, you need Marc's "Irish Drinking Songs for Cats." Irish Drinking Songs: The Cat Lover's Companion as soon as it becomes available. Keep an eye on Marc's website (listed below) for your chance to buy it. 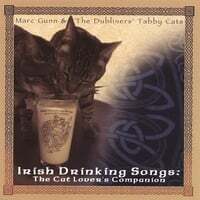 Sure, this CD is great if you have Marc's Irish Drinking Songs for Cat Lovers CD, it's all the original tunes that were used for the cat parodies, but more than that, it is a great collection of Irish music, all with Marc's unique flair. This is a great CD, and I know you'll enjoy it. I've decided to try and say a word about each song. 4) The Moonshiner. Oh! That's one of my favourites! I have never heard it before and I liked it immensely. The song is very jolly and the words are cool. 5) I'll Tell Me Ma. Well, it's nice, but I think it could have been performed more brightly. 6) Patriot Game. Frankly speaking, I did not like it. It provoked no emotions in me at all. The song is rather long and not very artistic. 7) Black is the Colour. It did not strike me as well. Nothing special about it. 9) Gypsy Rover. Another jolly and lovely song. The chorus sounds like a tongue-twister... I must try to sing it myself, it will be a challenge! 11) Barnyards of Delgaty. well, I would give it 4 out of 5. It's really lovely, but it hasn't become my favourite. 12) Fiddler's Green. coooool!! I have never imagined that Marc's voice can be so soft, warm, and sad. It touched my heart. 13) Lord of the Dance. I would give it the third place after The Moonshiner and Fiddler's Green. Marc performs it very lively and artistically. What can I say but this is a wonderful collection of tradional Irish standards, A great companion and a great CD on it's own. Great CD Worth Every Penny!!!!! An amazing job of providing the standards he parodies elsewhere! I admit it, I was surprised. I expected this to be good, but I didn't expect it to be THIS good. The songs are very clear, the recording quality top-notch, the musicianship seems excellent. These songs are treated with as much attention to tradition as there was creativity on the album to which this is a companion. Recommended!